On my trip to the Grand Canyon I read Cory Doctorow’s second novel, Eastern Standard Tribe. The book begins in media res with the main character informing us that he’s in an insane asylum and that he is deciding whether to give himself a lobotomy with a pencil. We also quickly learn he believes himself to be set up. I always find it to provide a very interesting tension when experiencing works of art that begin in the middle. Most of the time, as happens with Eastern Standard Tribe, the current story is interrupted to tell how we got here. Of course, this leaves the reader (or watcher in the case of a movie) playing the mental game of trying to figure out how we end up back at the beginning. You know the main character can’t die (unless it’s a work in which resurrection is allowed – plus some other ways that writers can be tricky and mean) and you know that no matter where he ends up going, he’ll end up in the location at the beginning. Regular books, as you know, leave you in the dark about where you’re headed. Doctorow chooses to tell the story in the same manner of Momento, switching between the past and the present, rather than focusing on the past until we’re caught up. This technique made it fun because even as you see how he ends up imprisoned, you are seeing his plans for getting out. Interestingly, the main character makes reference at perhaps being an unreliable narrator. However, nothing is made of this. I wonder if it’s a thread Doctorow abandoned or if it’s because of the main character’s need to be so thorough that he has to mention the fallacy of human memory. Or maybe something did come of it and I missed it on this first read-through. The book takes place in the very near future. In fact, it’s almost indistinguishable from today. There are a few differences – he has foreseen Smartphones (this was written in 2004) and how they are the nexus of information exchange. The main character uses it to communicate via something that looks like IRC as well as send and receive documents. Money has gone all digital, if I remember correctly. While we now have gigabytes of music in our cars as he predicted, we mostly have them on self-contained iPods, not in-car hard drives as some were predicting back then. As for the plot, it is a neat one. Basically, people belong to tribes based on the time zone they most identify with – perhaps the one they were born in – but not necessarily. They sync up all their interactions with that time zone and are loyal to people from that time zone above national loyalty or company loyalty. The main character, Art, and his co-worker Fede are from the Eastern Standard Tribe. They are working in London to sabotage a GMT company from the inside. Key to this plot working is the fact that these tribal associations are not well known in the public. Or at least, unlike Snow Crash or other Stephenson work, the tribe has not displaced the country as the state. Otherwise, why would a GMT company hire EST people? Rather, the tribal system comes across as an agreement with Internet-heavy tech geeks. It’s not that no one knows about it, Art mentions some papers on the subject, but it’s obscure enough that most companies wouldn’t worry about it. If the whole premise sounds a bit flimsy, see a monologue Art gives in the first quarter of the book for a wonderful explanation of how such a thing could actually evolve in our world. Without providing any spoilers, Art believes he has been setup by other tribes and committed into the asylum to keep from messing up a scam he has discovered. The majority of the present-day part of the book focusing on his attempt to prove his sanity are sobering and would be frightening, if I hadn’t already discussed the trouble with proving oneself sane with Danielle many times. She read a paper about it in college. There was also a This American Life story about it – when a guy tried to pull a real life “One Flew Over the Cuckoo’s Nest” and an episode of Futurama. So I’ve already had my time to get freaked out over it. If you haven’t, that part of the book will be suspenseful, dispairing, and frightening. Really, the only thing I didn’t really enjoy is that the book has a Neal Stephenson-esque ending. After the climax there’s a quick little epilogue that seems to end somewhat abruptly. While I didn’t like it as much as “Down and Out in the Magic Kingdom” or “Little Brother”, I did enjoy it. It’s not a must-read, but it’s recommended. The roundtrip to Phoenix was a long one, so after finishing “Eastern Standard Tribe”, I started reading some of the short stories from “A Place So Foreign and Eight More”. Doctorow has made six of the nine stories available for free on his website. Overall, I have to say that I like his long form fiction much better than his short stories. I think “Craphound” was my favorite story in this collection. While reading Doctorow’s books over the course of the trip, I got into a discussion with Danielle about the Science Fiction hardness scale. On the hard side you have Star Trek and other works of fiction dependent upon the science fiction aspects – space travel, teleportation etc as an integral part of the narrative. On the soft end, you have works like Doctorow’s that take place in Next Sunday AD it’s just barely far enough into the future to allow for some new crazy tech. “Craphound” is definitely in this soft science fiction category. It’s about two guys who look for treasure in garage sales – craphounds. The only reason it’s a science fiction story is because one of the guys is an alien. It’s too short to be unable to give it a spoiler if I say more. I really liked the ending. Random bit of info, after reading the intro to the collection as I wrote this blog post, it appears that either the main character or, now that think about it, the third character introduced towards the middle is somewhat based on Doctorow himself. “A Place So Foreign” was the first short story I read from this collection because I didn’t make note of the order the stories were presented in the book and I had just obtained all the text files. It was a very strange story about time travel. I felt as though perhaps Doctorow was doing a subtle parody of a style of Victorian age fiction, but I might be wrong there. Basically, it takes place in an alternate universe where all the different years have ambassadors – eg The Ambassador from 1900, the Ambassador from 1850, etc. The ambassador and his family live in the year 1975 which all the time periods travel to. The main character is a kid from the late 1800s (1895, I think) and he has a hard time readjusting to 1895 when his father is no longer the ambassador, hence the title. At first I had a very hard time figuring out why 1975 was so futuristic – again, I thought perhaps it was a parody of “Looking Backward: 2000-1887”. There’s a conversation that takes place during the climax of the short story that I THINK explains it, but I’m not sure and I don’t want to spoil it. I didn’t really like the short story that much. The story just didn’t resonate with me and I think the 1975 being the future really threw me off in a way that I never recovered from while reading the story. Next I read “Return to Pleasure Island”. At first I thought it was somehow related to “Down and Out in the Magic Kingdom” because it mentioned some of the same back stage stuff, but it turns out that Doctorow’s just a Disney Geek and included it for that reason. But, in fact, the story doesn’t really take place on Disney’s Pleasure Island in Orlando, but Pleasure Island from Pinocchio. Although, again, Doctorow mixes some Disney-ness with mention of Imagineers and cast members. The story involves three golems who work at Pleasure Island. Everything I know about golems comes from Discworld so, I thought they couldn’t talk and also required a scroll with instructions to work. I’m pretty sure from a little research I did after reading about them in Discworld that the stereotypical golem story involves golems taking orders too literally or working at a task (say digging a hole) with such untiring relentlessness that they dig all the way to the center of the Earth or something. Doctorow has none of that. The Golems DO work harder than the humans, but I think the main reason for them to be golems is for the surprise climax/ending. The ending’s quite unexpected. Finally, all the rest of the available short stories involved an alien invasion of earth. I read them out of order and interspersed with “Craphound” and “Return to Pleasure Island” so I wasn’t sure at first if they were supposed to be interrelated. There turned out to be three clues that point to them all taking place in the same continuity – foam, bugouts, and Canada. The foam is some super building material that allows for buildings to be melted away instead of demolished in a destructive fashion. It also allows for cheap housing. Bugouts are the name for the aliens in all the stories. And they all take place in Canada. I think that’s fun because I almost never encounter science fiction that takes place outside of the US or Britain (where most of the writers live). “Shadow of the Mothaship” was, to me, the weakest of the bunch. It basically involves a spoiled 20-something-year-old who resents being the child of the de facto ruler of the world after the bugouts arrive. He engages in all kinds of anarchic behaviour in protest. The ending is nice, but overall, I just disliked it and didn’t engage with the story. “Home Again, Home Again”, which I read first from these three stories, was my favorite of the bunch. Basically, the bugouts turn out to be “fascist, but it’s good for society” types who move all the insane people into multistory apartment-style asylums. From Doctorow’s writing, it’s left up to the reader to decide whether the bugouts were right about everyone or whether being around crazy people makes someone crazy. To help increase this thought experiment, Doctorow has the bugouts not want to break up families. So if one parent is crazy, the entire family goes into the asylum. And no one is told which was the crazy parent. At some point it’s revealed that sometimes sane kids can be let out when they grow up and the protagonist is one of those. The story is divided into sections alternating between a third person telling and his first person memories. It’s an interesting idea and it works very well for this story. The ending was a little weird in that I wasn’t 100% sure why the character did what he did, but it was still my favorite bugout story. I also really liked “The Superman and The Bugout”. It’s a cheeky little story in which Superman (who has SOME of the traits our Superman in the real world has) is actually Canadian and was raised by a Jewish family. This allows Doctorow to have fun with concepts like Superman drawing a pension – he retired after the Bugouts made war obsolete, and a stereotypical Jewish mom. It’s a fun story with dark edges to it. It almost seems like the perfect short story because it leaves me wanting more, but when I think about it intellectually, I realize that it would be too much of a stretch as a normal length story. A very fun read. 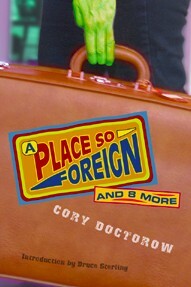 The interesting thing about this review is that I was ready to give “A Place so Foreign and Eight Others” a bad review. Anyone who would have spoken with me about it from the time I read it until now would have gotten a review of “pass, not worth reading.” But, organizing my thoughts for the review has revealed that there were two stories I didn’t like that I didn’t like so much, they were dragging the whole experience. I actually liked a majority of the stories. I’d probably look to buy an ebook with the whole collection so I could read the stories that weren’t available for free. 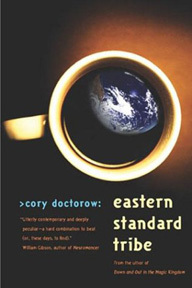 Also, in case you just skipped to the bottom here, I think that “Eastern Standard Tribe” is definitely worth a read. I’d just read some of his other books first.